You don't get many templates and they're not very customizable, but Strikingly does make it easy to build attractive and surprisingly capable websites. Strikingly is an unusual website builder with a focus on designing mobile-friendly single-page websites. Don't be put off by the 'single-page' restriction – it's not as limiting as you might think. Strikingly still allows you to add image galleries, a blog, custom forms, even a simple web store (with no transaction fees). There are many useful supporting features, too: responsive templates, video backgrounds, password protection, social media feed integration and more. Plans start with a basic free account. This allows building unlimited free sites within the same account, although they're restricted to a single page, can only use the Strikingly.com domain and your bandwidth is limited to 5GB a month. There's a simple web store included, but it only allows one product per site – Jimdo's free plan allows up to five. The Limited plan gives you a free domain and allows using your own domain on up to two sites. The bandwidth limit jumps to 50GB a month, and the uprated store allows five products per site. There's still Strikingly branding, unfortunately, even though you're paying $8 (£6.40) a month, or $7 (£5.60) if you pay for two years upfront. All plans are protected by a 14-day ‘risk-free’ trial. That's close to an industry standard, and enough for most people to get a feel for what the service can do, but one or two providers offer more, if you need it. For example, 1&1 MyWebsite gives you 30-days. While most website builders hide their signup procedure behind a Getting Started button, Strikingly isn't so shy. Visit the company website and the first thing you'll see is an animated form asking for your name, email address and password, or you can even sign up immediately via Facebook. Enter your details and you're presented with around 30 templates organized into categories like Business, Personal, Store and Blog. You're able to get a near full-screen preview of any template to get a feel for how it works, and you can choose and open your preferred option with a click. Website builders can be intimidating, at least initially, but Strikingly opens with a quick tutorial which points you to the key interface areas. There's no detailed information, but it's enough to get started. Experienced users might prefer to jump right in, and Strikingly's familiar interface makes that relatively straightforward. Click on objects to view their properties and edit them, tap the Preview button to check the results and select Help if you get stuck. It's not difficult, and most people will be exploring and learning about the service within a few minutes. The right-hand side of the screen is reserved for a view of the current page. The editor overlays some buttons on this, allowing you to change layouts, provide a new background (with video support), and more. But otherwise the page looks much as it will in your browser, and a few elements work in the same way (clicking the menu buttons will scroll to their page sections). Editing in Strikingly is more about working with prebuilt components than going your own way. For example, one section in our template contained two images, the first with text to the right, and the other underneath with text to the left. The editor allowed us to replace and edit the images, enter and reformat text, customize the layout (alignment, whether we preferred columns or rows, should the media be on the left or right) and more. But we couldn't add a new element which didn't fit the section format, like a button, or tweak existing elements by resizing or dragging them. While this is restrictive, it ensures the editor is very easy-to-use, and Strikingly probably has enough sections to keep many users happy. In a click or two you can add images, galleries, videos, social feeds, forms, a store, a blog and more. There are also a few apps to integrate your site with other services. These don't offer anything like the range of services seen in Wix and Weebly, but they cover many of the basics: Google Maps, SoundCloud, Google Calendar, PayPal, Wufoo forms, Ecwid stores, Facebook and Disqus comments, and a general Embed box for adding YouTube videos, tweets and more. Heading off to Strikingly's Settings dialog reveals some interesting advanced tweaks. Pro account holders can define custom actions which might be visible to users on a mobile device (calling, texting, finding directions). You're able to use a custom Favicon (the icon for your site in a browser tab), and set the icon used when your site is shared on social media. And a Collaboration feature allows inviting colleagues or friends to help develop the site. Everyone gets their own login, which means there's no need to share your password with others. Whatever you add or tweak, Strikingly does a good job of protecting you from accidents and mistakes. It automatically saves your work every minute or two, ensuring that whatever happens, you'll never lose too much if something goes wrong. And even after saving, you can keep tapping Undo to reverse all your recent changes. Site previews are another highlight. Buttons to preview your work in desktop, phone and tablet views enable you to check that your pages work across all devices. Another option allows viewing the live site, which means if you've noticed a problem and gone back to the editor to change something, you can view the results immediately, without needing to save your work first. It's a thoughtful touch which will save you time and hassle when tuning your website. Strikingly supports only the most basic of media types. You can add images, videos and galleries, access SoundCloud content, YouTube and Vimeo movies, and embed other content via the custom HTML box. That's not bad, but it can't compete with the best of the competition. There are some compensations. An integrated image editor can crop or resize your photos, change their orientation, or tweak brightness, contrast, highlights and shadows. It can also automatically enhance images in various ways, or apply multiple Instagram-style filters. In short, it’s far more powerful than the editors in most website builders. The features you do get are generally well designed and presented. You can change your page background to images or videos, for instance. There's a built-in library of background videos to explore. You can view them in action on your web page by just moving your mouse cursor over the video thumbnail, then choose your favorite with a click. There's also the ability to upload and store commonly-used images in a Strikingly-hosted library, allowing you to use them on multiple pages or sites without having to upload them again. There's no support for uploading videos, unfortunately, so you'll have to host those on YouTube or some other Strikingly-compatible service. It's easy to add a Strikingly blog to your page, as it's just another content section, and the process of creating your first post is just as straightforward. A couple of clicks takes you to the blog editor. Plain text boxes allow entering a title and subtitle, and you can then build the rest of your post with a mix of content blocks: headings, text, images, videos, separators, buttons, and custom HTML for embedding almost anything else. It all works well enough, and you could have a post online within a minute or two. While this looks very basic, check the settings and you'll find a few surprises. A Strikingly Subscriptions feature allows visitors to subscribe to your blog, for instance. The service collects email addresses and can send excerpts of any future posts with a click. There's a simple integrated comments system, with an option to have them approved before they become visible to everyone. Blog posts can also be organized into categories for easier browsing. There's RSS feed generation if you need it, and support for Google's AMP may give you an SEO boost. It's still not the best blog around, but Strikingly's offering is more capable than we expected, and it might be enough for many users. Web stores can be complicated to set up with many services, but Strikingly makes it surprisingly easy to get started. All you have to do is add the Simple Store section, hover your mouse over the store box and click Add Product. A form appears for the core product details: name, description, up to 10 images, and custom options such as color or size. It doesn't take long to spot some significant limits. You can't set a weight or custom shipping cost for a product, for instance – it's strictly one flat charge for the first item, and a fixed additional fee for every other item, whatever they happen to be. And taxes? Don't ask. Strikingly doesn't know or care about those. The store does offer support for PayPal, Stripe and offline payments, and unusually, Strikingly doesn't add a transaction fee on any of its accounts. As with the rest of Strikingly, the store is short on features, but easy-to-use, and with just enough functionality to appeal to undemanding users. Top website builders like Wix and Weebly often have a poor reputation for support, probably because they don't have enough staff to deal with their millions of users. If you can contact support at all, you might have to send an email and wait a day or two for a reply. Strikingly is, well, different. Tap the Help icon in the editor and although there's a link to a web knowledgebase, the very first box can be used to initiate a live chat. We tried this, expecting a lengthy wait, but no: a message told us we were number one in the queue, and an agent appeared in around 30 seconds. Our simple product question (is there any limit on the number of images you can upload?) was answered quickly and correctly (no), and the agent gave us further clarifications when asked. That was impressive enough, but Strikingly had more. A few moments after we'd thanked the agent and said goodbye, an email arrived with a transcript of our conversation – very helpful for longer chats where you might not remember every detail you'd discussed. Live chat isn't the answer in every situation, but Strikingly also provides a Help Centre where you can learn more about the service. This has plenty of articles on an array of topics, and although they mostly have little depth, there's enough information for novice users to learn the Strikingly basics. 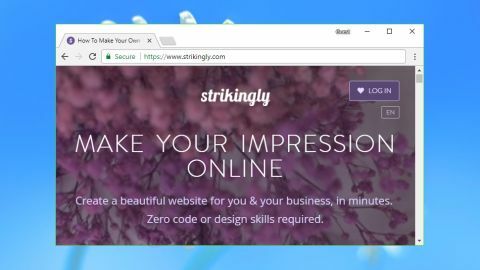 Strikingly's single-page-oriented website builder isn't as powerful or customizable as the top competition, but it's very user-friendly, and even novices will be able to build a good-looking site, complete with blog, within a few minutes. If simplicity is key, add Strikingly to your shortlist.